We’re just under two long hours away from the United States Men’s National Soccer Team’s international friendly against Scotland tonight at EverBank Field in Jacksonville, Florida (formerly known as Jacksonville Municipal Stadium and Alltel Stadium, and also the home of my Noles 21-14 win over Alabama in 2007). This is the first game of what United States’ coach Jurgen Klinsmann has dubbed a “five-game tournament” in which our national team will play three friendlies and two World Cup qualifiers over an 18-day stretch. This game will be shown live on the NBC Sports Network as the channel’s debut broadcast of a U.S. National Team game, and a record crowd is expected for this match as more than 37,000 tickets have already been sold for the event. This match is just a friendly, so it is more important that the team plays well and can start to build momentum for what should be a tough stretch over the next two and a half weeks. Of course, winning always feels great and is the reason to play the game, but building chemistry and finding out who plays well together should be coach Klinsmann’s main focus for the match this evening. The U.S. have collected four consecutive victories dating back to last year, and have recorded three straight shutout wins against Venezuela, Panama and Italy to begin the 2012 campaign, so to keep that up tonight and then with an even tougher midweek friendly with Brazil next Wednesday would be very impressive. 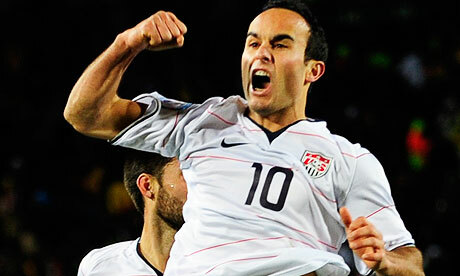 Landon Donovan will make his first USA cap since September 2011. Clint Dempsey, the United States best soccer player at the moment, will not play in tonight’s game as he nurses a groin strain and is still trying to get back to match fitness. The U.S. will have their most experienced goal scorer tonight though, as 30-year old Landon Donovan makes his first appearance with the national team since September of 2011. Donovan understands how important this stretch of games is for the USMNT, saying “Now it’s time to get down to business. We start with a couple games to prepare, but then the real deal starts again. We have to make sure our focus is right, because you can’t give away any games in qualifying”. Tonight’s match versus Scotland should be a great test to see where this team currently stands and where they can improve before facing off against Brazil in Landover, Maryland on Wednesday and then the more important qualifying matches to start off June. This is the first match since the February 29th unexpected 1-0 win in Italy, so it may be a bit sloppy at the beginning as the players get used to playing with each other again, but expect the rust to be shaken off early. This team seems focused and ready to attack the challenges that await over these next 18 days, and I’m sure that they are just as ready to get this started as the fans both in Florida and around the country are ready to watch it unfold. Let’s get it started. USA, USA, USA! Just seems right on this Memorial Day Weekend. This entry was posted in Soccer and tagged Clint Dempsey, Landon Donovan, Scotland, Soccer, Sports, USA. Bookmark the permalink.